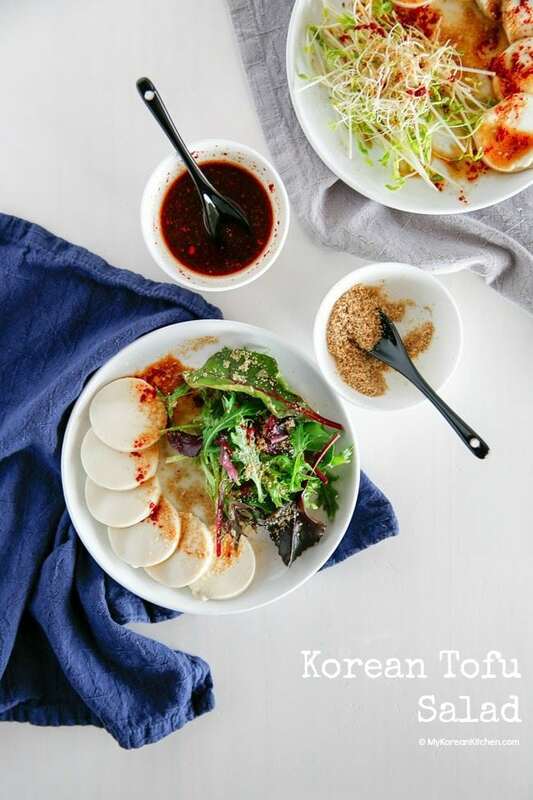 Korean tofu salad with honey soy chilli vinaigrette is cold tofu salad that actually tastes delicious and healthy. It is light, refreshing, and spiced up with Korean chilli flakes for authentic Korean flavour! Many of my non-meat loving readers will be happy about today’s recipe. I’ve been sharing meaty dishes lately so, for a change, I’m sharing something that’s light, healthy but still delicious and full of flavour. OK, I have to admit. Korean tofu salad sounds so boring even from its name. But wait! 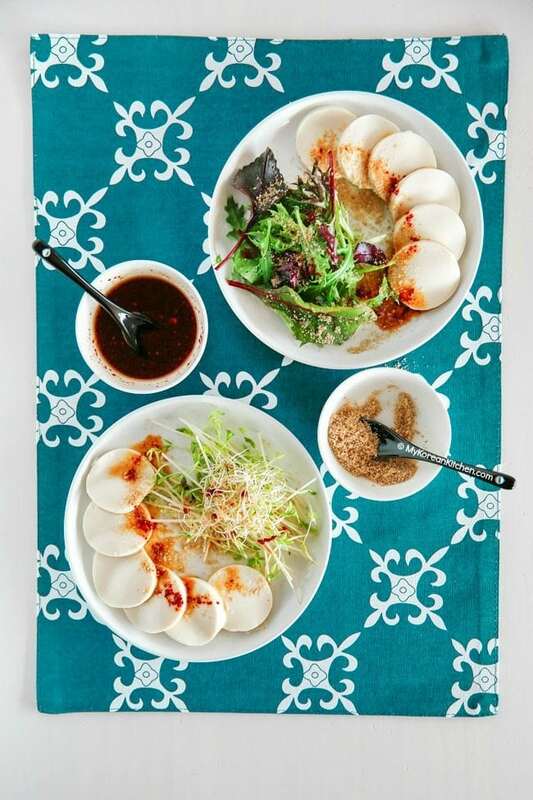 How about Korean tofu salad with honey soy chilli vinaigrette? I don’t know about you, but to me, it sounds interesting, invigorating, and inviting! This salad is so easy to make (less than 10 mins!) with your everyday ingredients. 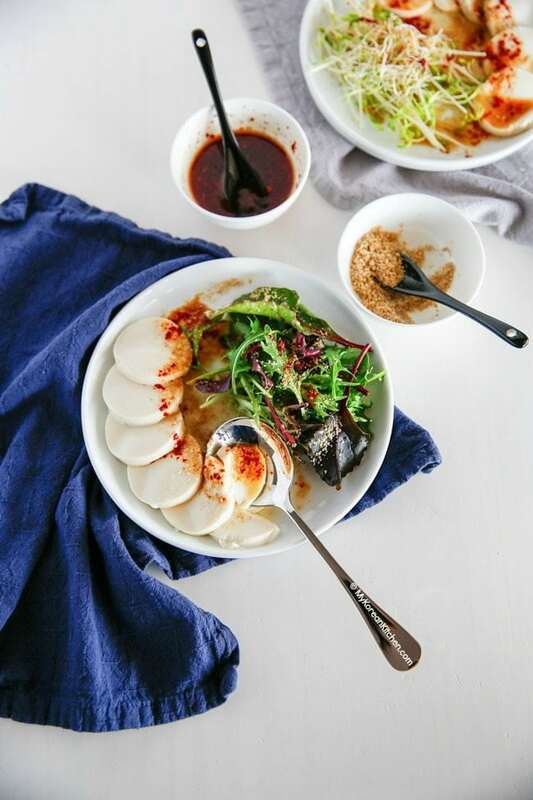 If you go to some fancy Korean restaurants, some of them serve steamed silken tofu with soy chilli vinaigrette as an entree and they are the best and freshest tasting side dish on the table. It melts in your mouth like cheese without leaving any oily after taste. That’s why my tofu looks like fresh mozzarella cheese on Caprese salad if you were wondering. Though you will find that the dressing isn’t quite that spicy. Even my little girl didn’t mind that. That’s a good cue. My final words. 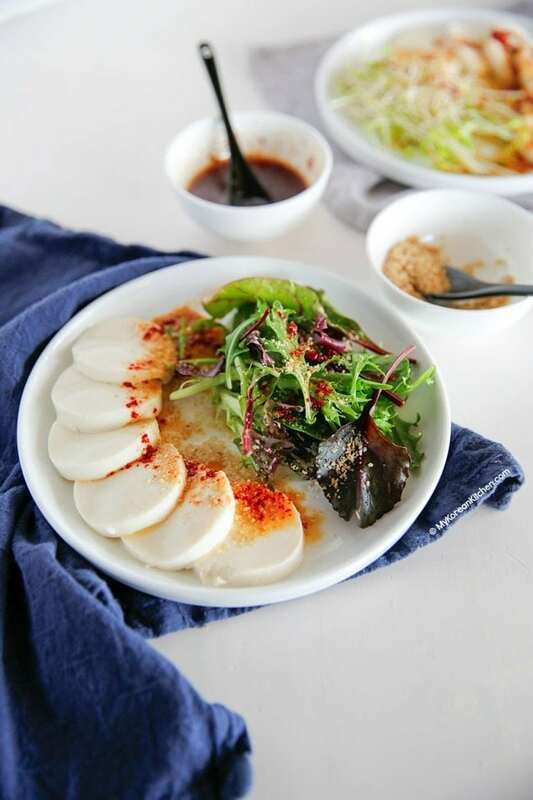 Try my Korean tofu salad with honey soy chilli vinaigrette! It adds a nice and healthy flavour to your main dish. I particularly love the nutty aroma smell that comes out from the crushed sesame seeds and sesame oil. The whole thing, the greens, tofu and the vinaigrette make a wonderful combination! 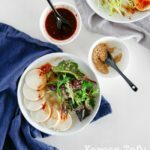 **If you want to learn about Korean ingredients, check my 30 essential Korean cooking ingredients list! -I used cold tofu for the recipe above but, instead, you can serve warm tofu by steaming or boiling it. In that case, keep the tofu in its original plastic container to keep it together. -Tofu can be served as a large block or small blocks instead of being thinly sliced if you find slicing challenging. -If you’re cutting, tofu should be cut just before you are about to serve. Otherwise, tofu will start releasing the water a few minutes later. -Once the salad is assembled, it’s best to consume straight away or on the day of making it at least. If you have ingredients left over, store them individually and separately. Combine them together just before you’re about to eat at a later day. 1 tsp Korean chili flakes (gochugaru) – Can be omitted or reduced per your preference. Though I highly recommend you add them! This dressing sounds awesome. How long will it last in the refrigerator? I love, love, love cold tofu! what a refreshing lunch or dinner while the last days of summer are still so hot. This dressing looks great. I can’t wait to also try this warm this fall and winter as well. You say I can leave the tofu in the packaging for steaming or boiling? do I need to poke holes in it or anything? and is it safe to poach it in the plastic? Thank you! When I serve it warm, I don’t poke any holes on the tofu pacakge. I only boil it for 2 to 3 mins in boiling water. 🙂 Hope you enjoy it!